We offer design ideas towards whatever style of bathroom design and fitting you require. The decoration of our bathrooms is done to the highest of standards to give maximum effect and quality finish. All our bathroom fittings comprise every item you can think of, such as loo roll holders, shelves, door locks, hooks, toothbrush holders and soap dishes to list a few. Enjoy the peace of mind to unwind with every finishing touch ‘just so’. Our co-ordinated fittings in contemporary chrome and stainless steel ensure the perfect fit. 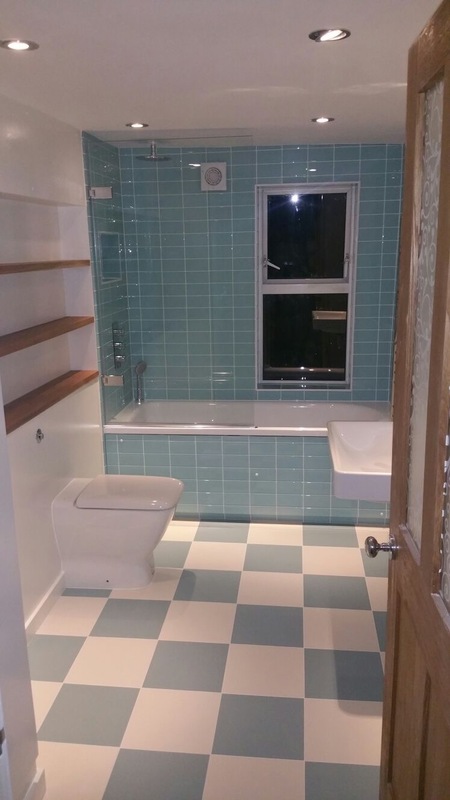 Firstly your existing bathroom needs to be removed and disposed of quickly. We aim to do this on the first day. If your suite is to be arranged differently or is a new room then new hot and cold water feeds and waste pipes will be required. Soil pipes can be moved or masseraters installed. Central heating feeds often need to be repositioned. These pipes are either concealed in wall cavities, false walls or boxed using WBP plywood. New ceilings are often required. For this we use 12mm water resistant plasterboard. The ceiling is then dry-lined using a fibre lining paper. False walls are sometimes needed to recess shower valves and taps if there isn’t sufficient space within the wall itself. New floors include timber, screed or floating floors. Insulation boards are required if using underfloor heating. These ensure that the heat is radiated upwards and not absorbed by the floor beneath. Walls need to be made good ready for tiling or painting. Exterior walls are rendered with sand cement before plastering to prevent moisture being drawn in. Aqua Board is often used. All surfaces are sealed with SBR solution prior to tiling and any plastering with PVA solution prior to painting. It’s essential to use appropriate moisture resistant paints such as non-porous emulsions, oil-based eggshell and gloss finishes. The door to a bathroom can be very important especially if all available space is to be used to maximum efficiency. We often use Eclisse single or double sliding pocket or surface mounted door systems because they are simple, functional, strong and reliable. A huge range of both UK standard sizes and made-to-measure systems (for doors up to 2m wide and almost 3m high) are available. So there are endless possibilities to transform your surroundings by creating new, usable space. Baths (unless free-standing) and shower trays are fitted before anything else and are tiled around to ensure maximum water resistance. Wall hung WC frames and back to wall cisterns are fitted and boxed in 18mm WBP plywood along with any surface piping ready for tiling. Wooden veneers or panels can be very effective. Underfloor heating is not a new concept. It was first used by the Romans who understood the benefits of invisible radiant heating long ago. In some European countries it accounts for 70% of new heating installations, but countries like the UK are still well behind in its adoption. Today however more and more of us are choosing to either build our own home or improve our existing homes and this coupled with a stronger focus on the environment and energy savings has increased the interest and adoption levels of underfloor heating. Marmlade Badger also has great experience in fitting ladder style radiators. These can be heated either through the central heating or electrically, or both. 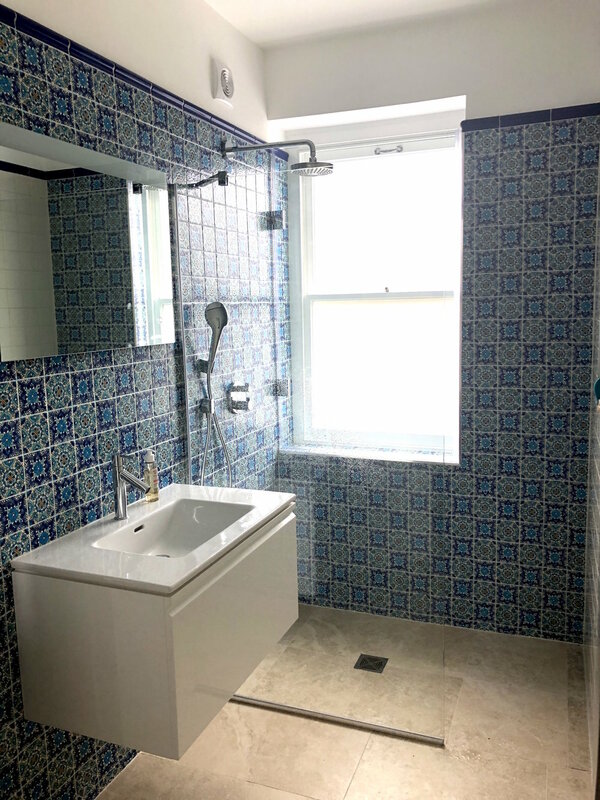 Any type of tile can be used on walls and floors, whether its made of natural stone, ceramic, porcelain, slate, granite, marble, travertine or glass. Great care and attention to detail is required to get the best results. Natural stone, slate, marble and travertine tiles need to be treated with a sealant to prevent staining and repel water. Grouts of all different colours are available to taste. Tiled surfaces are then polished. Walls need to be made good ready for tiling or painting. Exterior walls are rendered with sand cement before plastering to prevent moisture being drawn in. Aqua Board is often used. All surfaces are sealed with SBR solution prior to tiling and any plastering with PVA solution prior to painting. Selkie Board waterproof shower panels from Rearo are an excellent alternative to tiling for bathrooms, shower rooms and wet-rooms, offering a unique combination of beautiful designs with minimal maintenance. Mirrors are cut and supplied to whatever size and shape required within a couple of days. Heated mirror pads are connected and mirrors fitted. These pads can be activated when the lights come on or on a separate switch. These ensure that the mirrors stay mist free. Shaving sockets can be fitted singly or integrally within wall units. These are useful for electric toothbrushes which we all seem to use these days. Extractor fans are a must for most bathrooms and are required by law for new builds. Bathrooms are prone to mould and mildew if without. Fans can be fitted in suspended ceilings or through exterior walls and into chimney breasts. Activation can be from a light switch or a fused spur switch. Many fans come with timers either for delayed start and/or running times. Lights are installed under units to give a soft effect or recessed low voltage halogen downlights in ceilings on a dimmer switch. LED lights are a fun way to light a bathroom. As are surface mounted lights on walls and ceilings. All lights have to be either zone 1, 2 or 3 safe depending on where they are in relation to water outlets to comply with Part P Building Regulations. With Marmalade Badger you can rest assured that all applicable rules and regulations are adhered to.